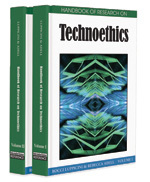 In this section we will consider the last direction, that is to say academic and professional guidance on the ethical contents entailed by use of technologies, in other words, guidance on technoethics. We shall commence with educational technoethics, a concept we developed in previous works (Cortés, 2005a; 2006) and which here we also integrate within the careers guidance field. A significant part of the research undertaken with respect to educational technology and means of social communication focuses on the ‘what’ and ‘how’ of their existence and use, but there is a lack of works that include an axiological dimension. Nevertheless, Grill (1997) argues that the first thing a professional should do is look for the ‘why’ of things from attitudinal perspectives, and states that technology in itself is not a problem, but rather technopolism understood as the ethical changes that become the cause of problems such as, for example, addictive behaviour at work vis a vis technology, or excessive pressure from use of technology in work environments. Science, Technology and Society (STS): Line of research which arose in opposition to the unidirectional technological model (+ science = + technology = + wealth = + well-being). STS analyse science ant technology in context and social aspects (values, policy, economy, etc.). Observational Laboratory on Technoethics for Adults (OLTA): Project, developed at two lifelong education centres from 2003 to 2005, for to teach skills for analysis, criticizing, choosing and reflecting on the new information and communication technologies by means of an axiological interpretation. Digital Divide: Social, economic and political differences between communities that have information and communication technologies (whit alphabetization technological, capacity and quality) and those that not. Technoethics as an End: That technologies and mass-media also include an assessing ethics connotation. Technology and Professional Guidance: Triple analysis: guidance on knowledge of the technologies, guidance on skills and guidance on attitudes and capacities. Technoethics as a Means: The implication is that technological and informational means can be transmitters of contents and activities of an axiological kind. Technoethics as an End and Means: A reply is required from a doubly interweaved aspect, that is to say, as a refl ection and performance about its axiological purpose and as an instrument to deal with attitudinal and ethical knowledge, its medium.